What makes a great art? What is the importance of showcasing it? These are all imperative questions that every artist must ask. Every culture has a taste of art in various representations. But for the art to be noticed, it requires a medium. This medium will not only establish its success, but it will also keep its existence. It is the art’s distinctness that appeals the expression of human emotion. The artist expresses his emotions through mediums like painting, sculpture, and photography. In the past, artists have to ask wealthy sponsors or benefactors to promote their works of art. Patrons finance and support their efforts at exhibiting their beautiful art crafts. This was the way before. The artists were compelled to a set value, conscientious about not offending their promoters. Nowadays, these limits have become extinct. Big thanks to innovations like the internet. Websites are now the common places to exhibit any form of art. Creative people will no longer have to request from sponsors. Website creation tools like WordPress make it easier for artists to display their works. This does not only applies to a particular environment but throughout the world. Isn’t this wonderful? 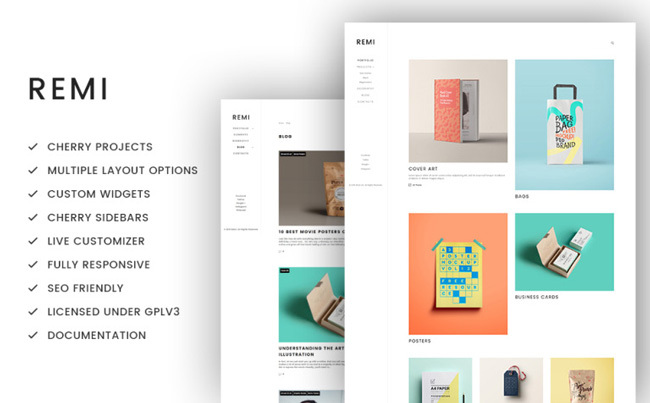 Designed by top Industry Leaders, Remi is a WordPress theme that is built to be responsive. Responsive design widens your horizons and lets you reach a broader audience. Although the theme can be used for any artwork and even pages, it can be primarily used by photographers and designers. The admin interface is also very intuitive. It is very user-friendly and can be easily and quickly set up no matter what your technological background is. With different layout options and live customizer, its customization process is very impressive. You can also personalize the Remi theme with its custom widgets, calendar, Google map, commenting system, and social options. The theme is also MailChimp-ready for your email marketing strategies. Remi includes state-of-the-art technology with features such as search engine friendly, performance optimization, HTML5 coding, and visual editor for a better user experience. These are a few of its advanced features. Check out its live demo for more information. The Steven Mosk modern theme is built with power. Its drag-and-drop page builder allows you to customize your personal portfolio. Steven Mosk offers many layout options for creative people. This theme is exceptionally contemporary and modern with a great potential for artistic expression. Through its deliberate presentation of visual content, you can showcase a smooth and fluid gallery. Its pleasant, full-view background video and lazy load effect will impress your visitors and followers. Steven Mosk is an ideal theme for artists of any kind. This theme can be used for art guild, art schools, or even for personal art portfolios. Its Content modules let you add buttons, contact forms, images, sliders, and many more elements. With impressive gallery and portfolio layouts, the theme is customizable. This theme may display a cutting-edge design, but it’s very easy to setup. Live Customizer lets you instantly view all the changes you make without having to reload your page. Features like responsive design, SEO-friendliness, online chat, and social options are readily available. This ensures that your users get the most out of your gallery. 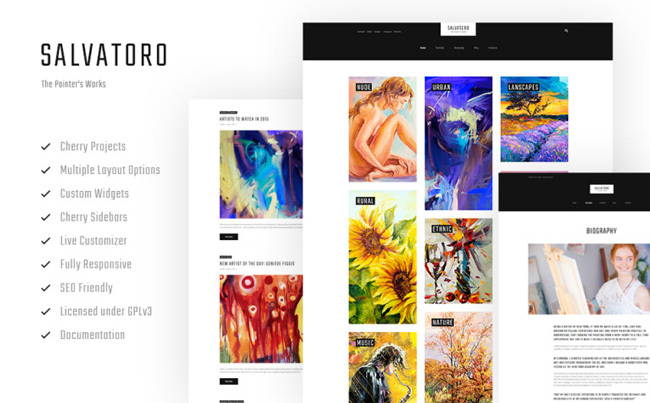 If you’re looking for fine art WordPress themes to make your artworks stand out, Salvatoro’s simple yet expressive visual design is perfect for you. Images are arranged in the Pinterest manner. The theme can highly showcase artist exhibition, sketches, and portfolio. It is ideal for artists, designers, and even photographers. You might be apprehensive about setting up the theme, but its ease of use won’t demand any prior technical know-how. Setting up the theme is very easy, and customizing your website is also as easy as the setup process. Upon customizing the theme, you can choose from a wide selection of layouts and structures. You can even save your layouts with its built-in library and use them for new pages. Salvatoro is completely retina ready, so it looks perfect on retina displays. Its simple and easy-to-follow documentation is enough to guide you through the setup process. Any user can effortlessly turn into an overnight expert. Other key features of the theme include responsiveness, drop-down menu, back-to-top button, commenting system, social options, and more. ExhibitA lets you take control of your website with ease. It is an astoundingly impressive and well-structured responsive theme. With its minimalist yet visually attractive style, your exhibitions will sure gain the success they deserve. Our WordPress illustration themes are extremely customizable. TemplateMonster’s drag-and-drop Page Builder allows you to easily configure your site. Feel free to customize the design of your site according to your taste. The theme is great for photographers but is also multipurpose. It’s straightforward and simple presentation of visual content is great for portfolio and gallery setting. This theme is very easy to setup and is very well-documented. Large sets of layouts are available so that you can experiment with the look of your site. You can even insert columns if you wish to add more. Save your layouts in its built-in library in case you want to use them again. Live Customizer also lets you see the changes you make in an instant; this will surely speed up your customization process. Get a feel of the theme by looking into our live demo. A full-screen Artwork theme will definitely entice your viewers. 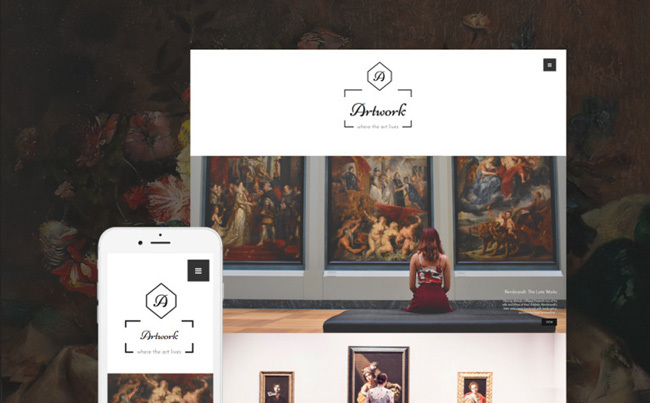 This WordPress Theme fits for artists who want to display high-quality artwork images. Online viewers will surely appreciate and admire the display of such works of art. The theme showcases graphic content in the most enchanting and modern presentation. Different variations of layouts will increase the diversity of your site. Simply shift to the image gallery, link, or video post types for a more appropriate focus on every artwork. This expansive and elegant theme has a built-in visual page builder. This visual page builder gives a drag-and-drop functionality. The theme may look technical, but the tool allows you to customize the theme with ease. 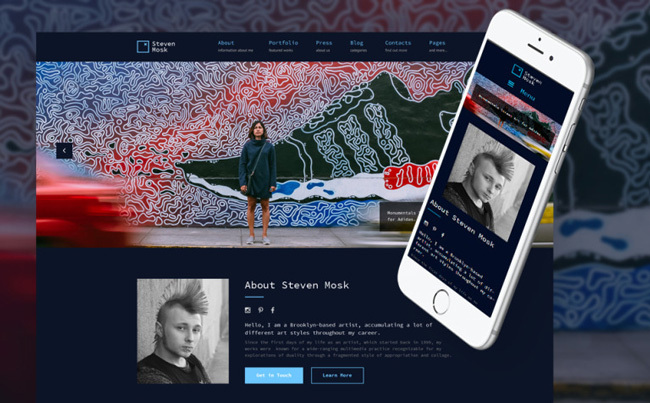 The Artwork is a great tool for people without previous web development experience but has a passion for showing powerful and moving artworks of paintings and photography. The theme offers unlimited colors and predefined color schemes. It’s a GPL-licensed product that gives you the freedom to change the theme. This fully responsive and SEO-friendly theme is not just designed for sculpture (although the name says it). The theme is great for art lovers and is multipurpose. It’s sleek and simple visual presentation is great for portfolio and gallery setting. The theme is suitable for artworks like expressive drawings, sketches, and paintings. With its clear-cut, minimalist and modern design, one can appreciate your artworks in plainness. The theme is retina ready for a more pleasing user viewing experience. Customize the Sculpture theme with its live customizer and multiple theme options. The simple documentation will guide you throughout the setup process. You can use and demonstrate lots of helpful features for your visitors’ comfort. The theme has calendar functionality where your followers can view and reserve class schedules. Custom widgets, Google map, contact form, newsletter subscription, social options, Instagram board, and Twitter feed are some of the key features of the theme. Don’t forget to look into our live demo so you can get a feel for the theme. 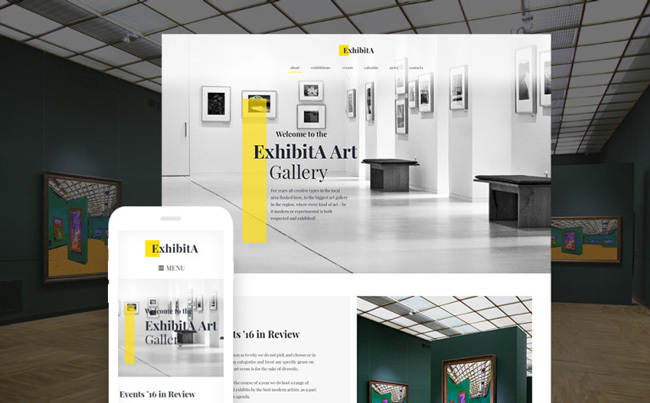 The Alberto responsive WordPress theme is great for creative portfolio such as art salons, sculptures, painting exhibitions, as well as photography portfolios. With its dark color palette based design, the layout focuses your large and high-quality images. The theme has built-in live customizer for ease of use. You also get multiple layout options for your site. It is built with Cherry framework and uses contact form 7. Features such as TM photo gallery are included to make the theme even more customizable. 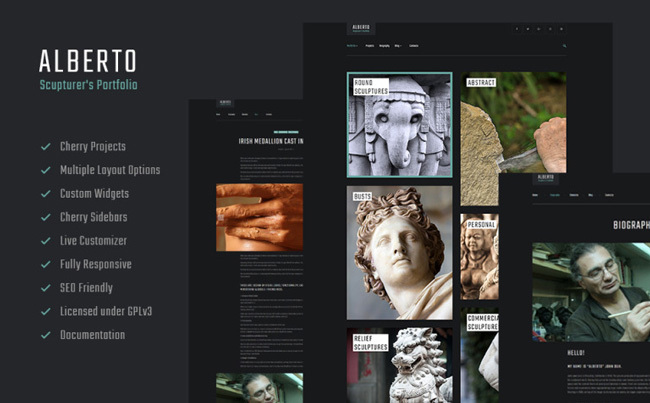 The Alberto theme offers three sidebar variations, six layouts, and five post formats. The Custom widgets of this theme let you use some advanced functionality such as a simple slider. Build a strong online presence with its social media widget. Also get more ways in showcasing your works of art by customizing your sidebar using its free Cherry Sidebars. Take advantage of more added features like SEO-friendly, retina ready, MailChimp ready, and social options. Your users will definitely get the most out of their browsing experience. 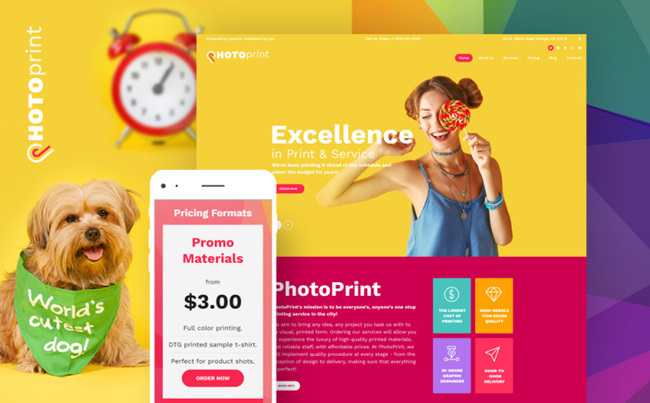 PhotoPrint is a modern, colorful yet a professional theme. The theme is actually not only for print shops. The theme is perfect for artists, parties, children’s sites, freelancers, and other business sites. It’s a creative WordPress theme that can ensure customer satisfaction. As the theme is highly customizable, you can choose other palette depending on your taste and niche. Thanks to its live customizer, all your layout changes can be instantly previewed without reloading the page. We use Cherry 5 framework as the basis of PhotoPrint. With its drag-and-drop page builder, you can easily build your site. Besides a user-friendly experience, it is also made for speed. Your users/customers will surely have the best site experience. PhotoPrint is an SEO-friendly WordPress theme. Due to the fast loading of pages, search engines will rank your site higher. Google maps will allow you to make your physical location known to your visitors. With a well-documented theme, the setup and installation will be very easy for you. 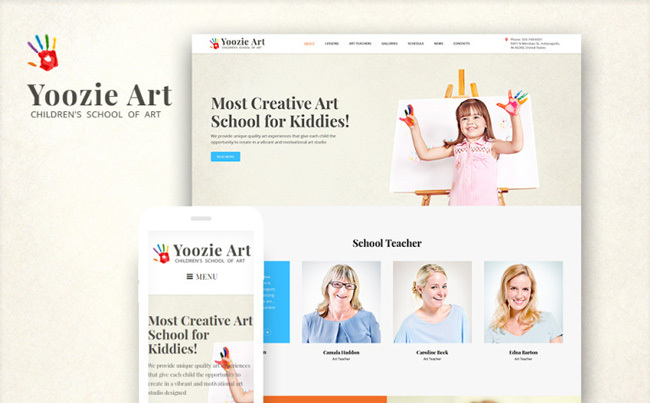 Yoozie is a cheerful, happy, and creative theme for Children Art School. The theme can also be used for other related niches such as children’s education, preschools, playhouses, nursery homes, and other establishments for children. This is an adaptable theme that consists some plugins to enhance your site’s functionality. One of those plugins is TM Gallery, which is a very powerful WordPress image gallery plugin. It allows you to create image albums with sub-folders. You can customize your image galleries. This is great in showcasing photos of school events, students, teachers, etc. We’ve integrated a timeline schedule plugin in the theme as well. Everyone can view your timetable of schedules and events. The Cherry services plugin allows you to display the details of each of your activities. You can also provide more information on your site. With a 100% responsive theme, your site will work great on any device. Leonardo Art School for Children is such a flexible WordPress theme that’s built with niche-specific functionality. It is designed for educational websites. The theme comes with a wide array of single-purpose pages and some variety of useful plugins and components to streamline time-management. Some of those plugins are ‘Appointment Manager’ and ‘Timetable’. They allow you to have full control over your classes schedule as well as your curriculum. The bright and colorful design is perfect for art programs, online art classes, online drawing, and painting courses. With its drag-and-drop builder, you will have ease of customization. You can create custom posts and pages. Additionally, this theme is delivered under the GPL 3.0 license. This means you can personalize it to build an infinite number of sites. Leonardo is also integrated with Google maps. This helps your potential customers find your location. It is not an overstatement to conclude that obstacles in showcasing someone’s creativity have been shattered. Race, gender, or color does not matter. Art will speak for itself. If you’re good, you will ultimately get noticed. WordPress is not the only medium to showcase your works. But, it is the best online platform where artists can grab some attention. With our illustration WordPress themes, you don’t necessarily need to have knowledge in web development. We got you covered. Our themes are very easy to setup and easy to use. Your creativity, plus our tools and themes will lead you to the success you’re aiming for. When displaying your works of art through a WordPress site, the only view that matters is the view of the people you are trying to reach. Technology has indeed presented new and advanced tools for the “Creatives.” Fields of art and creativity such as interior and fashion design have also grown wider. Our themes are also perfect for these niches. If you’re interested in putting up an art gallery or portfolio of your creative works, share your opinions in the comment box. 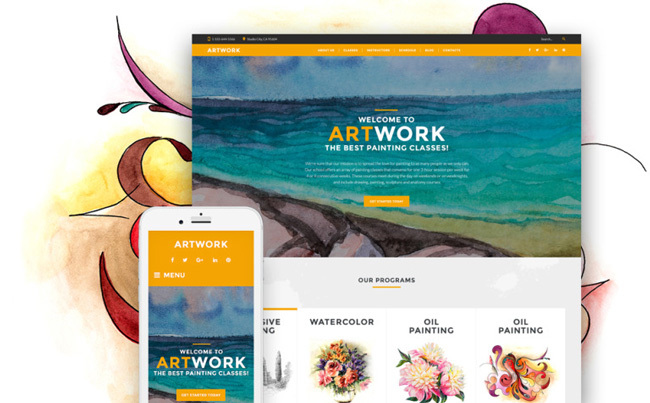 We’ll be glad to provide more details about our art WordPress themes. When you try our themes, you’ll certainly see results!